European Central Bank officials “widely” agreed that their immediate reaction to the outcome of the U.K.’s referendum shouldn’t fuel excessive speculation about more stimulus. “The view was widely shared that the Governing Council needed to reiterate its capacity and readiness to act, if warranted, to achieve its objective, using all the instruments available within its mandate, while not fostering undue expectations about the future course of monetary policy,” according to an account of the July 20-21 meeting published on Thursday. The U.K.’s decision to quit the European Union triggered pledges from central bankers across the region that they would do what is needed to minimize the economic fallout. While the ECB kept its stimulus unchanged in July, with President Mario Draghi saying it was too soon to gauge the impact of Brexit on the euro area, the Bank of England announced a package of measures the following month as it cut its benchmark rate to a record-low 0.25 percent. In formulating Draghi’s statement, policy makers sought to acknowledge the Brexit-related risks, yet remain reasonably positive about the economic outlook. While they noted there was “solid evidence” to prove measures taken so far were effective, they also stressed that the full impact hasn’t yet filtered through. Officials decided that it was “premature” to discuss any potential policy reaction “at this stage.” They made a “strong call” for European governments to limit uncertainty surrounding exit negotiations and provide a clear vision for the future path of the EU. Surveys published since the ECB’s last meeting have signaled that businesses and investors in the currency bloc are largely weathering the Brexit shock so far. Still, the data also showed growth cooled in the second quarter, with Germany carrying weaker French and Italian economies. Inflation was 0.2 percent in July, still far below the ECB’s target of just under 2 percent, with core inflation running at 0.9 percent. 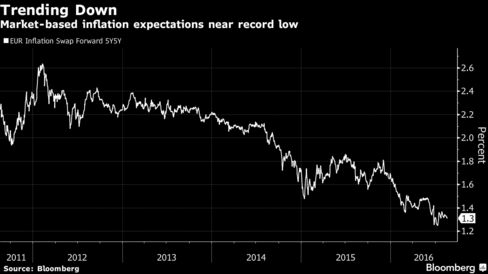 Officials noted “divergent” indicators of long-term inflation expectations. While survey-based measures have shown “greater resilience,” market-based gauges remain close to record lows. Council members called those levels “a source of concern,” but also pointed to technical factors that might distort the data. They reiterated their view that inflation rates would pick up over the coming years as stimulus works its way through the system to companies and households, the account showed. Policy makers referred to an apparent link between bank stock-price valuations and lending volumes. While equity-price volatility wasn’t necessarily a concern, it could hurt the transmission mechanism, they said. In the run-up to the July meeting, economists surveyed by Bloomberg predicted that ECB stimulus would be expanded as early as September, with some predicting that the central bank would have to change the rules of its asset-purchase program amid a shortage of securities. Draghi said after the meeting that the Governing Council hadn’t discussed specific instruments. Policy makers will receive another set of inflation and economic confidence data, as well as a gauge for private-sector growth, before their next policy meeting, which is scheduled for Sept. 8.